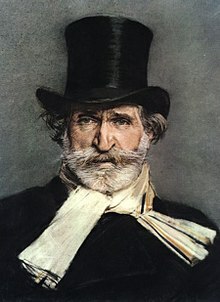 Giuseppe Verdi (janam: Roncole, Busseto ke lage, 9 nai to 10 October 1813; maut: Milan 27 January 1901) ek Italian opera ke composer rahaa. Verdi aur Richard Wagner 19th century ke sab se achchhaa composer rahin. January 10, 1884 Second revision of Don Carlos with Camille du Locle and Charles Nuitter. Omitted Act 1 and the ballet. Ii panna ke 3 July 2015, ke 12:23 baje, pichhla time badla gais rahaa.